Do you have mold or mildew in your home? Are you sure? With 3 bathrooms in our house, I'll admit that cleaning the bathroom is one of my least favorite household chores. But, the thought of having a dirty bathroom makes me squirm! I know that just because I can't see it (mold, mildew, germs), doesn't mean it isn't there. So, when I got the chance to review the new Soft Scrub Mold & Mildew Stain Remover, I jumped at the chance. 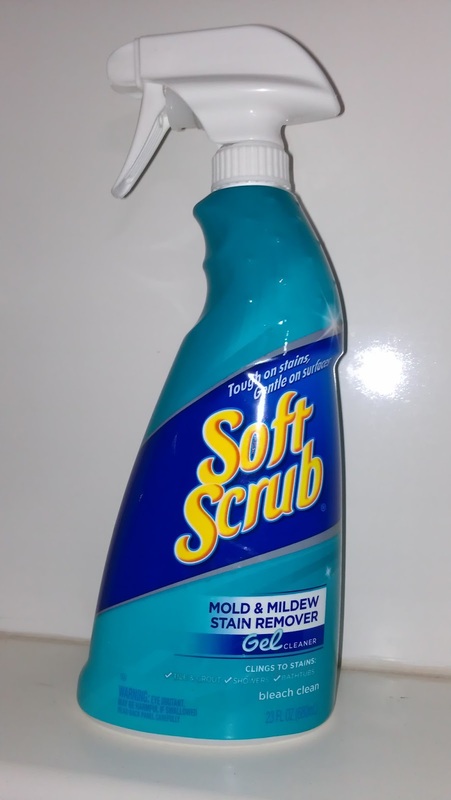 Soft Scrub cleaning products have been a favorite of mine for quite sometime because I know they work and they are easy to use! The spray bottles even work upside down, making it easy to get into those hard to reach places! 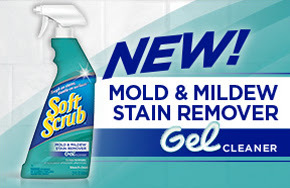 The new Soft Scrub Mold & Mildew Stain Remover Gel is thick and clings to those tough stains for maximum cleaning power. It is tough on mold and mildew stains while being gentle on your surfaces. I've used Soft Scrub cleaning products throughout my entire home: in my bathrooms, in the kitchen, and even in the bedroom windows where mold and mildew love to set in around late spring and early summer! I also love the fact that there are no harsh fumes or odors to worry about. There is nothing worse than getting light headed and sick to your stomach while keeping your house clean for your family. Soft Scrub not only leaves my household surfaces clean, it also leaves them smooth and free of grimy overspray films. This giveaway will end July 19th at Midnight EST. Disclaimer: I received complimentary Soft Scrub Mold & Mildew Stain Remover samples for the purpose of writing a review and hosting a giveaway. Regardless, I only recommend products or services I use personally and/or believe will be a good fit for my readers. The views and opinions expressed on this blog are purely my own. Results may vary. No monetary compensation was received. I want to try the 4 in 1 toilet care. I would like the Soft Scrub Total with bleach. I'd like to try the Advance Surface Gel for my laundry sink. I would like to try Soft Scrub Total All Purpose Bath and Kitchen Cleanser. I really like the total all purpose spray with bleach. It works really well! great review -- thank you! I love this gel for my bathtub so I would get more of that! I'd love to try the Soft Scrub Total All Purpose Bath and Kitchen Cleanser. I would love to try the Soft Scrub Total All Purpose Bath and Kitchen Cleanser. I haven't tried the mildew cleaner yet so I want to try that one. I'd like to try the All Purpose Bath & Kitchen Cleanser. Soft Scrub 4-in-1 Toilet Care. the only one I have used is the Soft Scrub with with bleach cleanser. I would love to try the 4 in 1 toilet care. I have been using the 4-in-1 Toilet Care, and I really like it! Wish it lasted longer, but it works well. I'd like to try the 4-in-1 toilet care. I'd love to try the Soft Scrub Total All Purpose Cleaner Lemon Spray. I like the Soft Scrub Total All Purpose Bath and Kitchen Cleanser.